Writing a novel? Learning indie publishing? This is the self-publishing guide you've been waiting for. Write. Publish. Repeat is publishing for beginners and experienced writers alike. 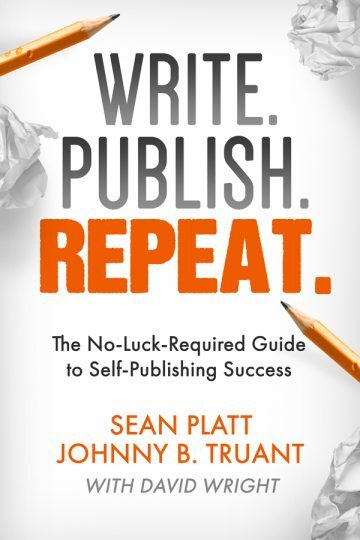 In 2013, Johnny B. Truant and Sean Platt published 1.5 million words and made their full-time livings as indie authors. In Write. Publish. Repeat., they tell you exactly how they did it: how they created over 15 independent franchises across six publishing imprints and 100+ published works, how they turned their art into a logical, sustainable business, and how any author interested in indie publishing can do the same to build a sustainable, profitable career with their writing. Write. Publish. Repeat. explains the current self-publishing landscape and covers the truths and myths about what it means to be an indie author now and in the foreseeable future — beyond just “how to write a novel” or NaNoWriMo and delving into the brass-tacks realities of indie publishing. It explains how to create books your readers will love and will want to return to again and again. Write. Publish. Repeat. details expert methods for enhancing creativity, building story worlds, characters, and plots, understanding your market (right down to your ideal reader), using the best tools possible to capture your draft, and explains proven best practices for editing. The book also discusses covers, titles, formatting, pricing, and publishing to multiple platforms, plus a bit on getting your books into print (and why that might not be a good idea!). But most importantly, Write. Publish. Repeat. details the psychology-driven marketing plan that Sean and Johnny built to shape their stories into “products” that readers couldn't help but be drawn into — thus almost automatically generating sales — and explores ways that smart, business-minded writers can do the same to future-proof their careers. This book is not a formula with an easy path to follow. It is a guidebook that will help you build a successful indie publishing career, no matter what type of writer you are … so long as you're the type who's willing to do the work. You'll Wish You Could Have Read it Years Ago!